• Kensington LiquidAUX for iPhone and iPod ($79.99.) Allows for "superior" sound quality via the auxiliary port, whilst simultaneously charging. Comes with a remote, so you don't have to take your eyes off the road. • Kensington LiquidAUX™ Deluxe for iPhone and iPod ($99.99.) As above, but with cradle and adjustable flexible arm. • Kensington LiquidAUX™ Bluetooth® Car Kit ($99.99.) Does the same as the above two kits, however, this will allow you to hook up your Bluetooth (A2DP) enabled cellphone instead. Automated music muting and call taking functionality included, as would be expected. • Kensington Car Charger Deluxe for iPhone and iPod ($49.99.) Cradle that includes adjustable arm, but without the music via auxiliary output. Basically a glorified charger/cradle. Pricey. 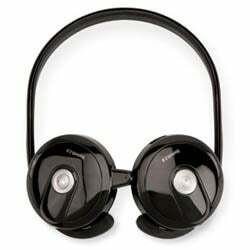 • Kensington Bluetooth® Stereo Headphones with Microphone ($79.99.) As the name suggests, these will be your stock Bluetooth headphones, compatible with A2DP, but also incorporating a microphone. Can be used as a standard Skype headset. alternative to installing Bluetooth in your car. Suggested retail price: $99.99. push of a button. Skype® compatible. Suggested retail price: $79.99. be available at other major retailers in March 2008.